The joint group meeting of the IOP’s particle, nuclear and astrophysics sections took place this week at the University of Manchester, UK. I was lucky enough to be in the crux of things as the conference developed. Despite the wind and rain, physicists arrived in their droves at the university’s Schuster building to take part. They weren’t disappointed. Professor Dave Charlton (University of Birmingham) opened the talks with a plenary on the Higgs boson and beyond the Large Hadron Collider (LHC). As the ATLAS spokesperson neared the end of the talk, he told us about a short circuit in the supercooled collider that had the potential to delay the restart by up to six weeks. Thankfully, shortly afterwards researchers were able to correct the problem by injecting a current of almost 400 amps to eliminate the short, putting the restart back on track. We see a lot at conferences – great talks, collaborations and new ideas. I learnt a few more things that you don’t see at every conference. Sat in the corner of a fourth floor office in the physics department sits an old wooden desk. Encased in a transparent shield, it is a reminder of how far we have come from the days of Rutherford and the breakthroughs that he made. It just so happens that just 10 feet away, there is an array of old copies of Journal of Physics G: Nuclear and Particle Physics dating back at least 20 years. It all felt like it belonged. When I was invited to join some of the T2K collaboration for a spot of karaoke I wasn’t sure what to make of it. I wasn’t about to say no, and it turns out it’s somewhat of a tradition when they meet in the UK and Japan. I don’t think any science takes place, but there were definitely some good attempts at singing. 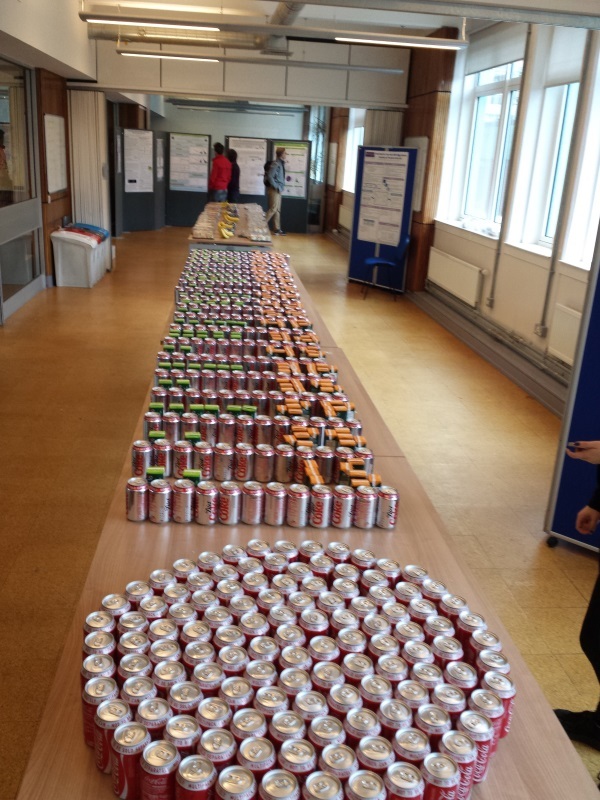 Have you ever seen hundreds of cans of cola and cartons of juice turned into a plot resembling nuclear energy levels? I have. It was a masterpiece. Thirsty researchers promptly destroyed it. 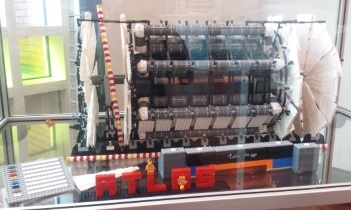 There is a LEGO version of the ATLAS experiment residing in the foyer of the Schuster building at the university. It’s pretty awesome, I’m not sure what else to say about it. On 1 April 2015, CERN researchers announced the discovery of the Force. A contact at CERN reflected – “Very impressive, this result is.” The full story is over at CERN. This year was the 41st of this long running tradition. By all accounts it was a pretty grim affair in the wind and rain, but physicists turn out to be a hardy lot. After a gruelling competition Bristol came out on top. All in all, it was a not only a good conference for science, it was also fun, and gave ample networking opportunities for young researchers. The fact that the poster session went on for hours after its prescribed evening slot was just one example. I’ll be sure to come the next time the groups meet, although I’m not sure my voice can take another round of karaoke. Image credit: Colin Adcock, IOP Publishing Ltd.